PARIS -- (Marketwire) -- 11/06/12 -- Today LaCie announced an all-new network storage solution that connects the entire family to their music, movie and photo files. The LaCie CloudBox stores files in a single location so family members can easily share them with friends, and access them from anywhere on any device. With the LaCie CloudBox, all files are stored in one place, enabling convenient file access and sharing. 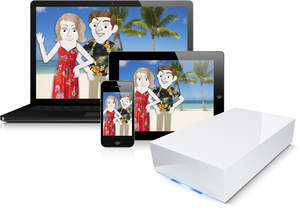 The CloudBox includes UPnP capability so Dad can stream Zombie movies to the Xbox 360®, iPad®, or any network-connected computer and TV. Even though families live under the same roof, their gadgets and file locations are very different. For one such family, the LaCie CloudBox brings them and their files together in surprising ways -- http://www.youtube.com/watch?v=OIxEMLYkPRg. The LaCie CloudBox, design by Neil Poulton, is available in 1TB, 2TB and 3TB capacities through the LaCie Online Store and LaCie Resellers starting at $119.99. For more product information, visit www.lacie.com.